I don’t think I had this Zinnia Fabric two hours before I had it cut up into this quilt. Before I got the fabric I had decided on making a different pattern, but after the fabric arrived I realized how big these Zinnias are! So I couldn’t cut them up, and instead made them into a basic block quilt so you can see those fun flowers. I only bought a fat quarter of the Zinnias, but now I’m wishing I had bought more, because the fabric matches everything and the colors are bright. The backing is a cotton aqua floral, I’ve used it before for backings, so I thought I’d spare you another picture. So sweet! I love the close up photo, you can really see the fabrics. Love the wallflower and the Butler dots, also love that yellow, I need it in pink. What a beautiful quilt! I love the zinnia fabric too. Oh, how I admire you! You have the patience and the skill to work a piece of art. It does have such pretty pinks and greens! 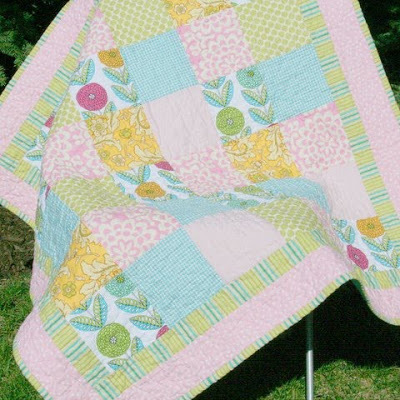 How many quilts have you made since you started quilting? 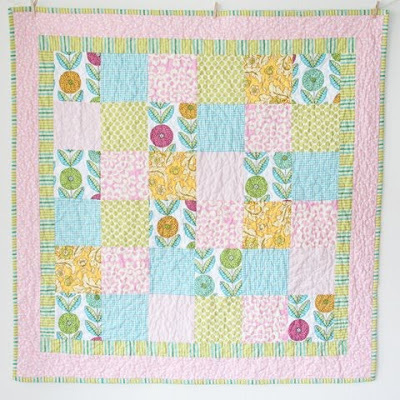 I love the zinnia quilt! Great fabric combinations too, especially the stripey and polka dot borders. What a fun project.